What brings it to you? What is it that - when you do it - brings you joy? Fulfillment? Joy? As you move through your day, your week...your year, how can you install moments of time that are yours? If you are going to be as much, have as much and give as much as you can, you've GOT to figure out how to make time for you. Recently, I got to spend a morning of one of our road trips on my bicycle. You see, Jodi and I were driving from Portland, Oregon back to Ojai, CA. 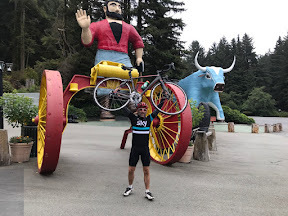 We stopped for the night at a little hotel near the border of the states, and I said, "I'm gonna ride the first few miles of our drive tomorrow." So, I woke up 90 minutes early, got on my bike and road to Klamath. 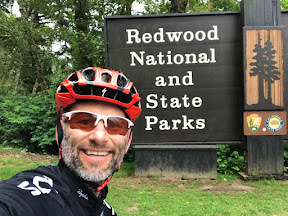 It wound up being 22 miles, through Redwood State and National Park. It was gorgeous. 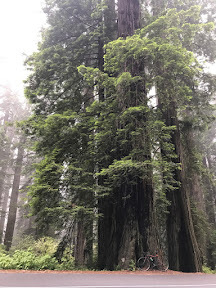 I rode through the fog and the foliage, and paused to gently lean my bike upon an Old Giant. Looking up, and out into the valley below, all I could think was, "Wow!" Your version of fun may not be getting up and out on an early morning bike ride with the air temperature is at 48 degrees F, through the fog, riding up 6% - 8% grades. But, here's what I am sure of. There is SOMEthing that brings you YOUR joy. I'd love to hear about it, and if I can, I'll share some ideas so you can get to it...more. How leaders become better leaders... they self assess often. Study the woman (or man) in the mirror, and then look out the window to find something to do anew. Here's a SELF-ASSESSMENT to prove that you work in an inspiring workplace. Self-Assessment: Do I work in an inspiring workplace? Are you making progress? Really? Would you say you have Momentum? For me, it's time to clarify my goals and take advantage of great new opportunities. Do you have have goals for 2017 that you want to achieve? Some goals you will achieve by yourself; others you’re going to need some help. The secret is in knowing the difference. At Get Momentum, we believe YOUR success will lie in learning how to ask for help. Please share...What are your goals and visions for the last half of 2017? Jodi gave the biggest speech of her life on Thursday. It was an hour #keynote to 750 people at the Path to Agility conference in Columbus, Ohio. She shared the story of working for a boss who to the outside world was beautiful, charismatic and successful. But to those in the office, Jodi's boss was a #BULLY whose leadership style was one of public humiliation and #shaming. “I must have hired the HANDICAPPED,” she’d say aloud if one of them made a mistake. She must have thought it would motivate us to work harder to not make ANY mistakes. But... it had actually the opposite effect. Jodi and her coworkers didn’t ask for help. They didn’t bring things up when they noticed a problem. They certainly didn’t do anything to bring extra attention to themselves or their projects. Jodi knew she couldn’t live her whole professional career in fear and dread. She eventually made the leap and left that well paid and “stable” job that was killing her slowly. Whether you work in a toxic environment (like Jodi did) or you're in a fantastic and supportive job (like she is now), learn how to make it even better, starting June 1st. Click HERE take the SELF-ASSESSMENT.